January 2nd that is…Because if we are, that means we made it through the holidays, right? Two years ago at this time, my family and I appeared on Anderson Cooper’s daytime talk show to discuss living with loss through the holidays. Anderson’s mother, Gloria Vanderbilt was on the set with us to talk about how losing her son and her husband years ago totally changed how she feels about the holiday season. She told us that rather than dealing with the holidays, she would rather go to sleep around Thanksgiving and wake up sometime in January when it’s all over. The pain is too much for her. I am sure that there are so many who have loved and lost who feel the same way. The holidays are so very tough on so many levels. There are broken traditions, broken family structures, un-hung Christmas stockings, empty chairs at the holiday dinner table and countless other memories that will remain just that – memories. The holidays will never be the same and there’s not a thing we can do about it. The same year that Jeff died, my kids and I decided that instead of hanging his stocking, we would spread it out to our family and made it into ornaments. We knew that we needed to break the tradition of hanging the stocking, and making it into an ornament was the perfect solution. For the 4th year now, the kids hung Jeff’s “stocking ornament” on the tree with such pride. 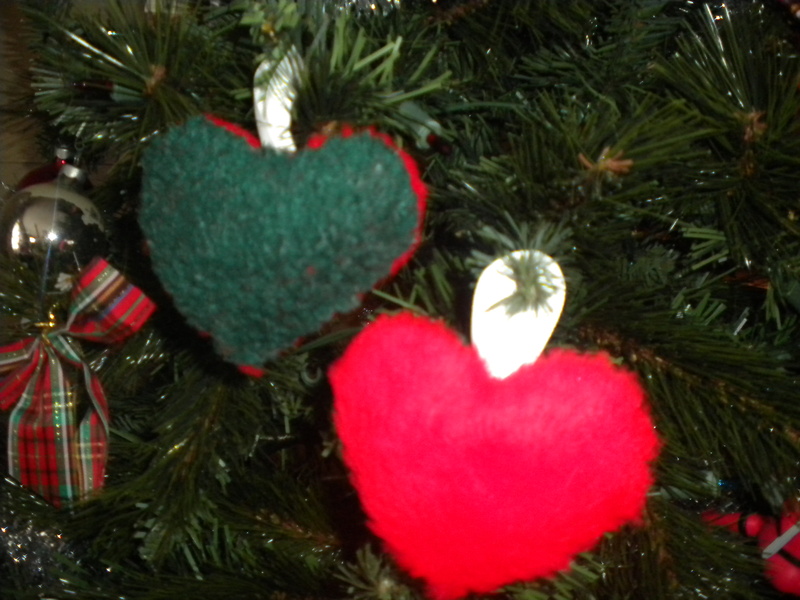 They know that their dad’s love for Christmas will always be with them in the form of that heart-shaped ornament. I suppose that’s their new tradition that even though they didn’t choose, it certainly helps. This time of year also reminds me of a poem that I read a few years ago that so accurately describes the feeling of losing a loved one. 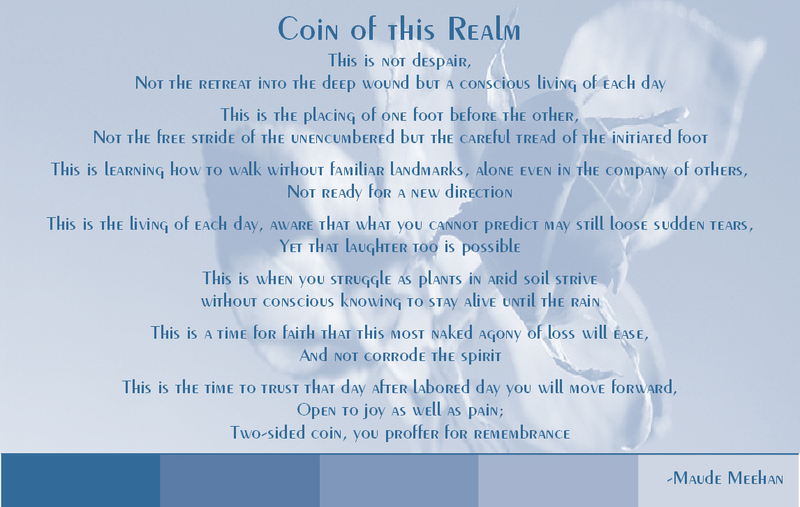 It’s called, Coin of this Realm and I am attaching it below for you to see. It’s a poem of love and loss but also one of hope and strength. It recognizes that although the loss is devastating, we must also look for and appreciate the good things around us. It drives home the notion that even though all you want to do is go to sleep and wake up when it’s all over, that there are still blessings and good things that happen in the middle of loss. It is our choice to see these good things and to embrace them. Those are the things that get us and our children through. I formatted this poem into a 4×6 picture that you can print and frame. I hope it gives you some hope and validation for the future and I hope that you print it, frame it and display it in your home. Please feel free to share your new holiday traditions here too. We would love to see and hear how you celebrate the holidays differently now. We want to know what works for you and your kids. The more we share, the more we can help each other. Thank you so much! Wishing you a happy, healthy holiday season!